So-called “shadow lobbyists” can have long careers influencing Congress without ever registering or filing public reports because the government has so few people tracking compliance with disclosure laws. The U.S. Attorney’s Office for the District of Columbia, which is responsible for policing the lobbying industry, received nearly 3,800 referrals from the House and Senate about firms that potentially violated the law between 2009 and 2018. More than half of those — 59 percent — are still pending and could take years to resolve, according to a new government report. “When it comes to ensuring compliance to the law in a timely fashion – when a lobbying campaign is actively attempting to shape American public policy – the track record is almost nonexistent,” said Craig Holman of the watchdog group Public Citizen. 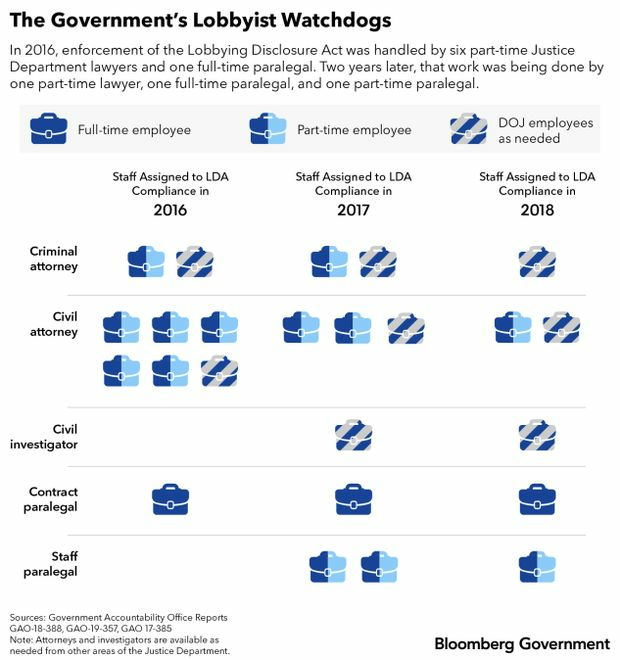 In 2016, enforcement of the Lobbying Disclosure Act (Public Law 104-65) was handled by six part-time Justice Department lawyers and one full-time paralegal, according to a report to Congress by the Government Accountability Office (GAO). Two years later, that work was being done by a much smaller staff: One part-time lawyer, one full-time paralegal, and one part-time paralegal. Other attorneys and investigators within the Justice Department can be pulled in as needed, the department told GAO. There hasn’t been an enforcement action for an LDA violation in four years, and since the law was enacted in 1995, there have been a total of nine civil enforcement actions. The Justice Department told the GAO for its report released March 29 on 2018 enforcement that it has “sufficient personnel resources” to enforce the lobbying law. “The U.S. Attorney’s Office for the District of Columbia is committed to identifying and pursuing organizations and individuals that repeatedly disregard their filing obligations under the Lobbying Disclosure Act,” Bill Miller, a spokesman for the office, said in an email. “Repeat offenders who fail to take their reporting obligations seriously will be held accountable in order to protect the public’s right to know who is seeking to influence policy on Capitol Hill,” he wrote. For firms that want to stay on the right side of the law, “the lack of lawyers in the office has complicated matters when there are tricky legal issues to be resolved,” Caleb Burns, a partner at Wiley Rein, said in a telephone interview. The Justice Department has put resources into policing a different group of lobbyists — the ones required to register under the Foreign Agents Registration Act (FARA). Brandon Van Grack recently transferred from Special Counsel Robert Mueller’s office to oversee the FARA Unit, which is housed within the department’s National Security Division. Compared with the staffing to police lobbyists for U.S. entities, “it’s pretty notable contrast,” said Robert Kelner, who chairs the election and political law practice at Covington & Burling. “The GAO report is striking in that it reflects a continuing low-level enforcement activity of the LDA,” Kelner said. Kelner represented former Trump national security adviser Michael Flynn, who pleaded guilty in 2017 to lying to the FBI about his contacts with Russia’s ambassador to Washington. Flynn later admitted to making false statements in lobbying disclosure forms about his lobbying for the government of Turkey. Miller said the office had no comment about how much DOJ does to investigate lobbyists who fail to register. And the GAO’s annual audit of compliance with the LDA doesn’t take unregistered lobbying into account. Spend 20 percent or more of their time lobbying for each client over three months. Geduldig, whose clients include the American Petroleum Institute and Boeing Co., said he’d like to see an updated definition of what lobbying means, so that registration requirements would apply to advertising agencies, think tanks, public relations firms, attorneys and media platforms. “Disclose any money spent to influence policy outcomes,” he suggested. A House-passed bill, H.R. 1, would expand the definition of lobbying to include the strategic advisers that advise advocacy campaigns and lobbying efforts and decrease the threshold for registering as a lobbyists to 10 percent. The bill would mandate establishment of a team within the Justice Department to handle enforcement of U.S. lobbying for foreign governments. It wouldn’t do the same for compliance of domestic lobbying laws. It’s not a game that’s likely to change any time soon, since Senate Majority LeaderMitch McConnell(R-Ky.) has said he won’t bring the legislation up for a vote.